With a rash of MCL injuries occurring in the NBA recently (Iman Shumpert and Nene Hilario), I thought it would be appropriate to showcase a couple of kinesiotaping techniques for inner knee pain. In addition to knee ligament issues, medial knee pain can also be caused by inflammation of the tendons from leg muscles that attach in the area such as the sartorious, gracilis, and semitendinosis. KT Tape provides a way to tape the inner knee using two small strips and one larger strip of tape. Rocktape on the other hand provides support in the region using a regular strip and a half strip of tape. After an MRI today, Iman Shumpert of the New York Knicks was diagnosed with a sprained MCL in his left knee. The injury occurred in the third quarter of Wednesday night’s game against the New Orleans Pelicans. Shumpert drove into the lane and tried stopping when he landed and twisted his left knee. This is the same knee that he had surgery for a torn ACL towards the end of his rookie season. Since it is a sprain, the Knicks stated that they expect Shumpert to miss two weeks. 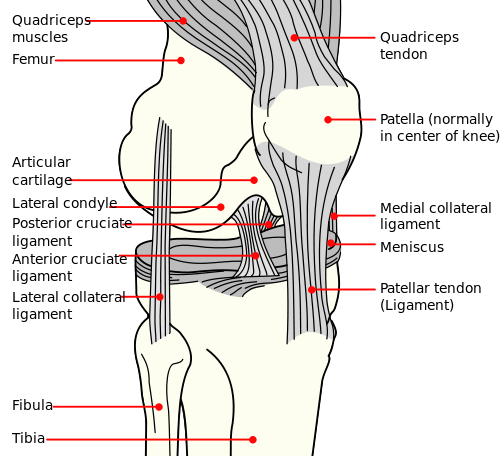 The medial collateral ligament (MCL) of the knee is located on the inside surface of the knee joint. It attaches the medial aspect of the femur to the medial aspect of the tibia as noted in the image above. Most MCL sprains occur with bending, twisting, or quick changes of motion such as in basketball, football, and soccer. Grade 2: Moderate pain and edema present with some joint laxity when a valgus stress is placed on the joint. Recovery takes about a month. Grade 3: Complete tear of the ligament with severe joint laxity and instability. Usually requires knee stabilization brace with recovery taking 4 to 6 weeks. J.R. Smith and Tim Hardaway Jr. will both see more playing time with Shumpert out. Smith logged 40 minutes on Wednesday night, finishing with 19 PTS and 3 3PT. Hardaway Jr. on the other hand has come out of the All-Star break on fire, shooting 46% from the field and scoring 23 and 16 PTS while going 7-15 from behind the arc in the past two games.